Lisa heard rave reviews about this easy one-pan (plus a pot for rice) recipe from a few people in her running group, and it sounded right up our alley. Broccoli is roasted in the oven with a little oil and some spices, and is later joined by shrimp seasoned with chili powder and lemon. Couldn’t be simpler! We served it with some Bhutanese Red Rice. Ha, I love that the most time intensive part of this recipe was the time I spent peeling and deveining the shrimp for ya. I know, this is super easy. I’ll have to tell them in running group that it was a success. The broccoli is really good — I read a tip one of (the many) blogs that featured this recipe to make sure the broccoli is dry when you roast it, otherwise it may not develop those delicious crispy edge pieces. Yeah… I could see maybe three… or in our case, two. But really, if you’re gonna get four servings out of this, you’d have to have additional dishes along side. True. Or maybe we’re pigs. Maybe. I prefer “food hearter”, though. Another thing I like about this is that I only have like 2 dishes to wash.
Yeah it’d be nice if you could make a couple dinners that only used a few dishes, so I’d benefit from that. What, you don’t like the dirty-every-dish-we-have cleanups? Preheat oven to 425 degrees. In a large bowl, toss the broccoli with 2 tablespoons oil, coriander, cumin, 1 teaspoon salt, 1/2 teaspoon pepper and chili powder. In a separate bowl, combine shrimp, remaining 2 tablespoons oil, lemon zest, remaining 1/2 teaspoon salt and remaining 1/2 teaspoon pepper. Spread broccoli in a single layer on a baking sheet. Roast for 10 minutes. Add shrimp to baking sheet and toss with broccoli. Roast, tossing once halfway through, until shrimp are just opaque and broccoli is tender and golden around edges, about 10 minutes more. 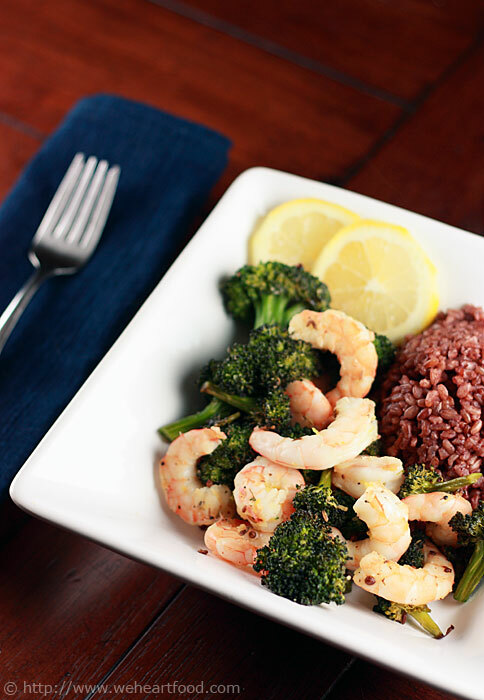 Serve with lemon wedges, or squeeze lemon juice all over shrimp and broccoli just before serving. This entry was posted on Tuesday, February 17th, 2009 at 6:16 pm	and is filed under Main Dishes. You can follow any responses to this entry through the RSS 2.0 feed. You can leave a response, or trackback from your own site.